Isaac Emmanuilovich Babel, Russian: Исаак Эммануилович Бабель (13 July [O.S. 1 July] 1894 – January 27, 1940) was a Soviet journalist, playwright, and short story writer. His stories, especially his treatment of the Cossacks in the war with Poland and his treatment of the Odessa underworld, were innovative for both their subject matter and their crisp, clean prose. Babel's treatment of war was unflinching and unromantic, in contrast to the romanticized attitudes found in earlier Russian treatments, such as Leo Tolstoy's War and Peace. While Babel's narrator seemed to support the Bolshevik cause, his realistic treatment of actions of Marshall Budyonny's soldiers brought on the Marshall's ire, who was scandalized by Babel's "slander." Babel's art has much in common with Expressionism, with its striking images designed to provoke an emotional response from the reader. Born to a Jewish family in Odessa during a period of social unrest and mass exodus of Jews from the Russian Empire, Isaac Babel survived the 1905 pogrom with the help of Christian neighbors who hid his family, but his grandfather Shoyl was one of about 300 Jews who were murdered. To get to the preparatory class of Nicolas I Odessa Commercial School, Babel had to overcome the quota for Jewish students (10 percent within the Pale of Settlement, five percent outside, and three percent for both capitals), but despite the fact that he received the passing grades, the place was given to another boy, whose parents bribed the school officials. Schooled at home for a year, Babel went through the curriculum for two school years. In addition to regular school subjects, he studied the Talmud and music at home. Inspired by his teachers of French language and literature, young Babel revered Gustave Flaubert and Guy de Maupassant, writing his own first stories in French. After an unsuccessful attempt to enroll at Odessa University (again due to the quota), Babel entered the Kiev Institute of Finance and Business. There he met Yevgenia Gronfein, his future wife. 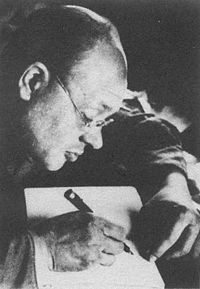 Photograph of Isaac Babel writing by Georgii Petrusov. In 1915, Babel graduated and moved to Petrograd (now St. Petersburg), in defiance of laws restricing Jews to confinement in the Pale. In the capital he met the famous Russian writer, Maxim Gorky, who published some of Babel's stories in his literary magazine Letopis' ("Летопись," "Chronicle"). Gorky advised the aspiring writer to gain more life experience and later Babel wrote in his autobiography: "... I owe everything to that meeting and still pronounce Alexey Maksimovich (Gorky's) name with love and admiration." One of his most famous autobiographical short stories, The Story of My Dovecot ("История моей голубятни"), is dedicated to Gorky. The story "The Bathroom Window" was considered obscene by censors and Babel was charged with violating criminal code article 1001. In the next seven years, Babel fought on the Communist side in the Russian Civil War, also working in the Cheka, precursor to the KGB, as a translator for the counter-intelligence service. He served the party in a number of other posts, including the Odessa Gubkom (regional Bolshevik party committee), in the food requisitioning unit, in the Narkompros (Commissariat of Education), and in a typographic printing office. He also served as a newspaper reporter in Petersburg and Tiflis. He married Yevgenia Gronfein on August 9, 1919 in Odessa. In 1920, during the bloody Russian Civil War, Babel was assigned as a journalist to Field Marshal Semyon Budyonny's 1st Cavalry Army, witnessing a military campaign of the Polish-Soviet War of 1920. He documented the horrors on the war he witnessed in the 1920 Diary (Konarmeyskiy dvevnik 1920 goda) which he later used to write the Red Cavalry (Конармия), a semi-documentary work of fiction. Red Cavalry was first published in the 1920's. On the advice of Maxim Gorky, the young Babel, his literary career only beginning, set off to join the [[Soviet Red Cavalry] as a war correspondent and propagandist. The legendary violence of the Red Cavalry, present in Babel's writings, seemed to harshly contrast the gentle nature of the young writer from Odessa. This contrast is also apparent in stories like "My First Goose," where the narrator, on account of his glasses (a sign of his status as an intellectual), must prove himself worthy of his fellow soldier's camaraderie (and deny his "intellectuality") by brutally killing a goose and ordering a woman to cook it. Babel wrote: "Only by 1923 I have learned how to express my thoughts in a clear and not very lengthy way. Then I returned to writing." Several stories that were later included into Red Cavalry, were published in Vladimir Mayakovsky's famous LEF ("ЛЕФ") magazine in 1924. Babel's honest description of the brutal realities of war, far from revolutionary romanticism, brought him some powerful enemies, among them Budyonny, but Gorky's intervention helped to save the book, and soon it was translated into many languages. Back in Odessa, Babel started to write a series of short stories set in the Odessan ghetto of Moldavanka where he was born, describing the life of the Jewish underworld before and after the Russian Revolution of 1917. During this same period, Babel met and maintained an early friendship with Ilya Ehrenburg, while continuing to publish stories, to wide acclaim, throughout the 1920s. In 1925, Babel’s wife emigrated to Paris. Left: Beria's January 1940 letter to Stalin, asking permission to execute 346 "enemies of the CPSU and of the Soviet authorities" who conducted "counter-revolutionary, right-Trotskyite plotting and spying activities." Number 12 on the list is Isaac Babel. In 1930, Babel travelled in Ukraine and witnessed the brutality of the collectivization in the USSR. Babel's stories were very popular in the early 1930s, but his realistic descriptions of the horrors of war and the underbelly of Odessan society ran afoul of the authorities. As Stalin tightened his grip on Soviet culture in the 1930s, and especially with the rise of socialist realism, Babel increasingly withdrew from public life. During the Stalinist campaign against "Formalism" in the arts, Babel was criticized for alleged "Aesthetism" and low productivity. At the first congress of the Union of Soviet Writers (1934), Babel noted that he was becoming "the master of a new literary genre, the genre of silence." After numerous requests he was permitted to visit his family in France, and in 1935 he delivered a speech to anti-fascist International Congress of Writers in Paris. Upon his return, Babel collaborated with Sergei Eisenstein on the film Bezhin Meadow and worked on the screenplays for other Soviet movies. 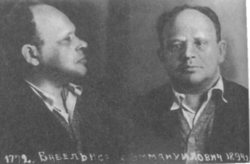 The NKVD photo of Babel made after his arrest in 1939. After the suspicious death of Gorky in 1936, Babel noted: "Now they will come for me." (See the Great Purges). In May 1939, he was arrested at his cottage in Peredelkino, and eventually interrogated at Lubyanka, the KGB prison, on charges of espionage. Babel told his wife "Please see our girl grows up happy." After a forced confession, Babel was tried, found guilty, and, on January 27, 1940, shot in Butyrka prison. His widow, Antonina Pirozhkova (Антонина Пирожкова), did not know about his fate for 15 years. 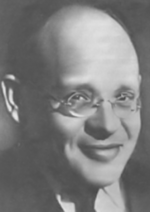 According to early official Soviet version, Isaac Babel died in a prison camp in Siberia on March 17, 1941. His archives and manuscripts were confiscated by the NKVD and lost. Many of the stories were banned in the USSR until the glasnost of the 1980s. On December 23, 1954, a year and a half after Stalin's death, in the midst of the "de-Stalinization" campaign begun after Nikita Khrushchev's "secret speech" outlining Stalin's excesses to the twentieth Communist Party congress, Isaac Babel was publicly exonerated of the charges against him "for lack of any basis." "No iron can stab the heart with such force as a period put just at the right place." "Over the town roamed the homeless moon. I went along with her, warming up in my heart impracticable dreams and discordant songs." ↑ Odessa Pogroms, Center of Jewish Self-Education "Moria" and the American Jewish Joint Distribution Committee, 2000, Retrieved December 18, 2007. Babel's Biography (PDF) by Gregory Freidin (A version of this essay in Critical Biography was published in European Writer of the Twentieth Century [NY: Scribners, 1990]). Prose in original Russian language at lib.ru. Konarmiya, Norman Davies describes Babel in The Sarmatian Review, 3/1995 issue. This page was last modified on 6 March 2018, at 19:29.